Godaddy Domain Name Registration Prices. In this article I help you choose a cheapest domain name registrar for your new domain name. 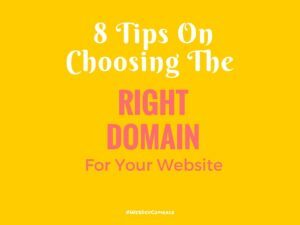 Deciding on who to register your domain name with can be a challenging piece of work especially if you are registering a domain name for the very first time since most of these domain registering companies promise much more than they can literally fulfill, and therefore the purpose of this article is to help you chose wisely a cheapest but still a quality domain name registrar. We all love it when we save a penny after shopping. I recall my old commerce teacher talk about “consumer surplus”. So straight to the purpose, let me show you where you can save some dollar for yourself. Namecheap is an old company that has been in web hosting and domain name registration for the last 15 years since 2000. Talking about acquiring a cheap domain there is no way they can miss out, let me tell you why and I will share my experience with you. Done with history, now let me take you inside Namecheap prices for domain name registration. 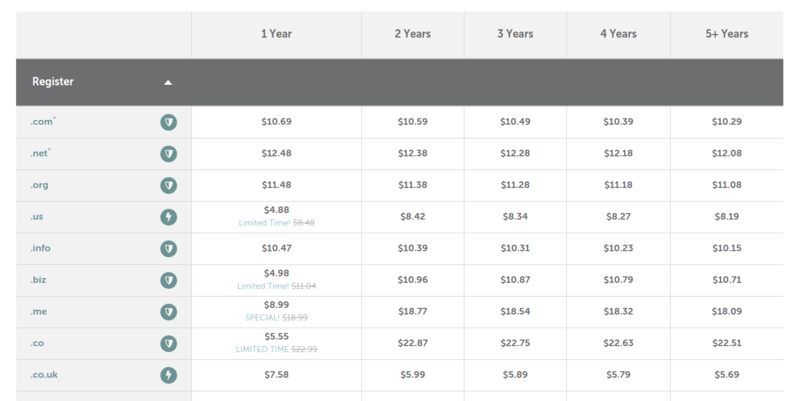 The preceding screenshot shows a table of prices in different number of years you pay if you choose to register a domain name with Namecheap. Take for example if you want to register a dot com domain name, they charge you $10.69 excluding ICANN (the Internet Corporation for Assigned Names and Numbers) charges a mandatory annual fee of $0.18. Namecheap includes WhoisGuard fee for your first year in the same package. Their prices for renewing a domain name are pretty much the same. Take a look at another screen shot I have for you here showing Namecheap renewal price charges. Most companies will charge you a higher price for renewing your domain after the initial purchase period has expired and this is how they usually make huge sales on you however Namecheap sticks to the same prices for domain renewal. Usually you may want to transfer your domain from one registrar to any other you may wish and this is how you can you can take advantage of companies offering low prices for first time purchases and soon when they begin digging deep into your pocket, you just transfer your domain to a cheaper domain name registrar. To transfer a dot com domain name for example from any other registrar to Namecheap, you are charged $9.69 and you carry on with the rest of the period you had from the old registrar, for example if you still have a period of 2 years with domain name registered with Godaddy or Hostgator and you choose to transfer it to Namecheap, you only pay $9.69 and don’t have to pay for the rest of period the old registrar owed you in this case which is 2 years. (Click the image for other domain extensions). When you choose to purchase a domain name from Namecheap you can also receive a discount when you use coupon codes which slice your expenditure even further. Talking about quality and customer support, its not always a fair deal to think about quantity, thinking about how many domain names you can buy for less without stopping for a second and think about quality of service and customer support. Now Namecheap has got an excellent support center, in several cases I have been able to get help through live chat session, and through submitting a ticket and their response is pretty quick except placing a phone call, which they do not have at the time of this writing. They have a clean interface, We all love to navigate a hassle-free platform something that won’t waste our time trying to figure out where a checkout button is or trying to locate where the cart is. I am talking about their website, it is not cluttered with up-sells. Unlike some other registrars like Godaddy, Namecheap will not induce the customer to purchase more expensive items, upgrades, or other add-ons in an attempt to make a more profitable sale. Godaddy is really an old company in this business, talking about web hosting and domain name registration. They are nearly as old as the Internet itself and really really popular as far as domain name registration is concerned. However, because we are looking at cheapest prices we can get but still with quality service lets go straight to the Godaddy pricing. 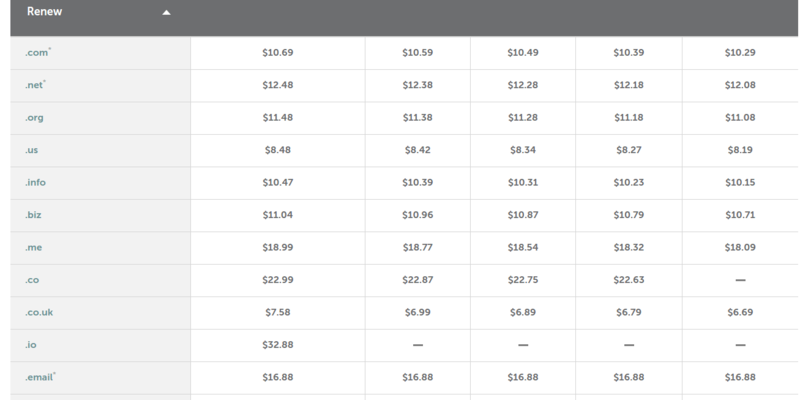 Bellow is a screenshot from Goddady domain name pricing page. 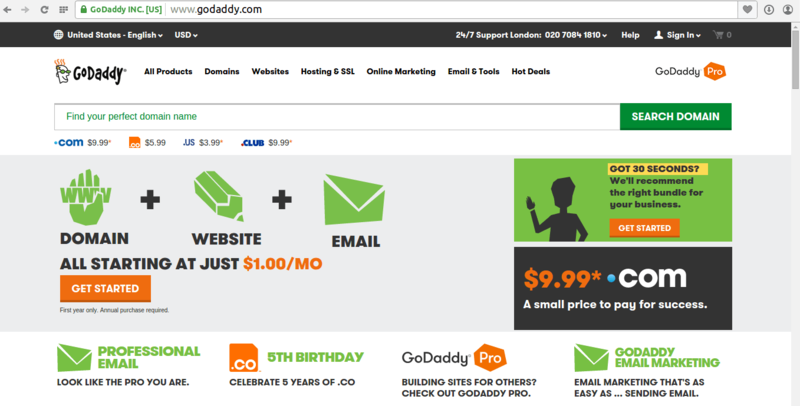 If you can look closely or better still if you click on the image you will realize that Godaddy charges $12.99 for a dot com domain name registration for a single year. This price excludes WhoisGuard fee and ICAAN mandatory fee of $0.18. This means that during registration process you will have to choose weather or not you want a WhoisGuard protection charge added in your shopping cart in case you want privacy. 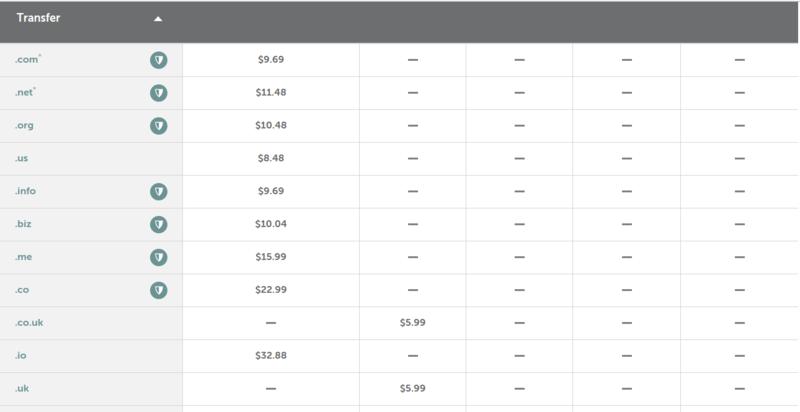 However, you can use Godaddy coupons to chop these prices keeping in mind that their promo codes do contain exclusions. You can find a full list of terms and restrictions in the details section of the offer. You are charged $14.99 to renew a dot com domain name with Godaddy. Meaning that after your first payment period has expired, you will then have to pay this or the then amount of money, that is, because prices are subjected to change due to several factors. Below I have a screenshot from Godaddy where you can checkout the prices for different domain name extensions too. And now if you choose to transfer your old domain name from some other domain registrar its important we see how much you spend for that with Godaddy. As of this writing, you need to pay $7.99 to transfer your dot com domain that still has a period of one year with your old company, transfer charges vary for different periods of years and domain extensions (Click image to see for other domain extensions). Well, looking from a quality service perspective on Godaddy. Godaddy has had issues with customer support and help. Now this is not from a personal view because I haven’t worked with Godaddy for long but I did a research on them and found a hundreds of customer complains. As an idiom which says “Where there is smoke, there is fire.” I don’t mean to say there is no business without customer complains but when complains span to over hundreds of them, then there is a fire. However, if you have anything for me as regards to Godaddy customer support we can discuss it in the comment box below this post. 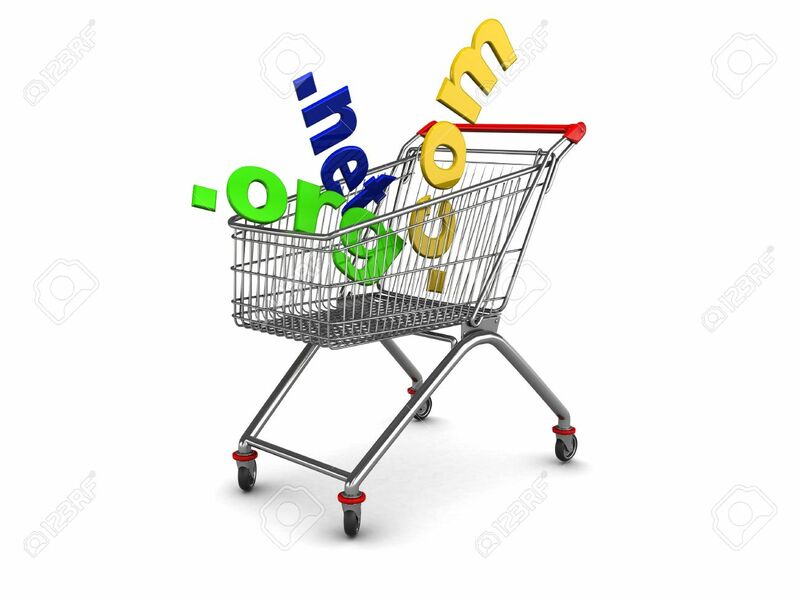 Up-sells, It is not easy to get out of Godaddy’s hands without being induced to purchase a more expensive item and if you are a newbie as regards to domain name registration, you may easily fall their victim. Recommending or suggesting to a customer a related domain name especially in cases where the one a customer wanted is already taken is okay and almost every other registrar does it. But when a website page is long and cluttered with more other products it becomes worse and annoying. However, Godaddy can be a good choice to buy a cheap domain name. Here is how, for instance if you want to quickly own a domain name of your choice for future use. I find Godaddy cheaper in a short run compared to Namecheap especially when you use Godaddy coupons. So if you want to buy yourself a domain name quickly and maybe you are not in position to use it immediately, Godaddy is a right choice. There are many more domain registrars however, and some of these are probably new and will charge you less and even lower than both Namecheap and Godaddy but we really never know how long such registrar companies are going to stay in business before they close and try something else. That is why in this review I chose Namecheap and Godaddy because they have been in this business for decades and we all want to register our business with those we can trust. From the information I have been able to carefully select for you, it is very clear that Namecheap is the winner, both in quality service, customer support and cheapest price you can get as regards to domain name registration in a single package. Note* Prices mentioned and shown above are subject to change at anytime. Its a nice idea to confirm with the respective websites. So, my recommendation for you is Namecheap, why? To buy a cheap domain name with Namecheap clicking this link. Yes, agree with you that namecheap.com is the best domain registrar in the market which is providing cheap price for their customer. I have also seen one resource http://www.cheapsslcouponcode.com/store/namecheap.com where namecheap is providing discount offer for domain name, web hosting as well as ssl certificate too. I hope it will help people to find all discount deals at one place. Superb site you have here but I was curious if you knew of any community forums that cover the same topics talked about in this article? Well, at the moment I don’t know any but I’ll share with you when I find one. Excellent review of Namecheap and GoDaddy. I purchased mine through namecheap and am very happy with the price and service. I like that you chose to compare it to godaddy seems godaddy is one of the more commonly known and used domain providers. Thanks Shannon, I appreciate your complement. Yeah I agree with you Godaddy is really popular. How about hosting Shannon, do you host your website(s) with Namecheap as well…? Nice article, you seem knowledgeable on the topic here and I am in the process of changing a few domains from Godaddy. I really have no complaint againts them, I’m just moving to where I can take care of all site from one platform. Thanks for appreciating Debra. Its indeed a good idea to have your websites managed and taken care of on a single platform for convenience especially after you’ve compared different registrars and found one that is right for you. Name cheap is not bad, especially for the price. But I would choose Go Daddy over them for one important reason. Go Daddy offers phone support and while Name Cheap does not. I have browsed all through the Name Cheap website and cannot find any phone number or reference to phone support? If I am wrong about this, please guide me to where I can access this on their site? They do have live chat. I have had periodic disputes on numerous occasions with domain name providers, and IMO phone support is far more efficient in solving these disputes. I appreciate your comment Ronn. You are right Namecheap have no phone support. I agree some people are comfortable with phone support however the live chat support at Namecheap is pretty efficient its only those that would find placing a phone call convenient that may find the live support at Namecheap somewhat inconveniencing. And also ticket submission is as well efficient because they are prompt at responding at such issues, Godaddy have got a phone support which is cool though the waiting time is quit long.